❤Magicfly Diameter play parachute toy, with bright color and lovely octagonal shape. ❤Designed with 8 handles, which ensure easier grabbing for kids when playing games. ❤Made of eco-friendly and durable non-toxic 100% Polyester material, both rot-proof and Waterproof. ❤Help training kids's team work ability, visual development, major movement and fine movement. ❤Recommended Using Places: Preschool, kindergarten, school, garden shopping mall, courtyard etc. Kids will love this vibrant play parachute! This Magicfly parachute toy is sure to bring various fun and wonderful for team-building exercises and countless games! 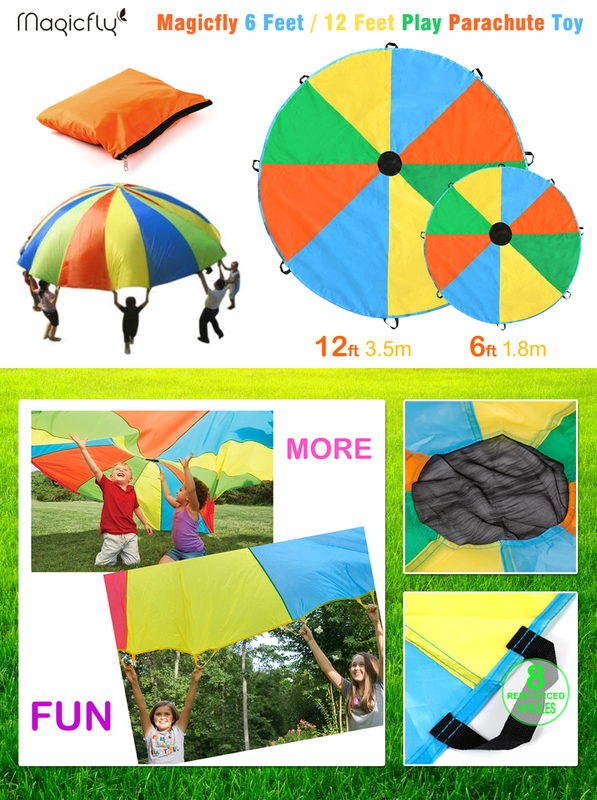 Made out of polyester with 8 handles for easy holding, this kids play parachute is great for children' parties, playgroups, schools, picnic and more. Popcorn - Place a number of beanbags, small balls, or cottonballs onto the parachute. Shake to make them pop up like "popcorn". Making Waves - Children can make small, medium, or large movements to make various types of "waves" around the parachute. Merry-Go-Round - Children turn their bodies sideways and hold the chute with one hand. They then walk around in a circle, making a "Merry-Go-Round." For variety, children can hop, skip, jump, etc. Switch - Call out a birthday month, age or a pre-assigned color and have children swap places under the parachute before it falls. Mushroom - Standing, lift the parachute waist height. Count to three - with "one" and "two" being small practice lifts. On three, all lift the chute overhead, and crouch down pulling the parachute edges down as well. This creates what looks like a "mushroom." A parachute can also make a great fort by draping it over furniture. your sheets for your childrens play fort.